via press release: Labor day Weekend special. Subscribers Nationwide Can Catch Up Before New Episodes Return on September 8. SHOWTIME® TO MARATHON FULL CURRENT SEASONS OF Dexter® AND RAY DONOVAN. NEW YORK, NY – (August 29, 2013) – This weekend, SHOWTIME subscribers will have the opportunity to catch up on the climactic eighth and final season of Dexter and the critically-acclaimed hit drama series RAY DONOVAN, when the network airs marathons of both series on Labor Day Weekend. Replays of the first nine episodes of Dexter and RAY DONOVAN will air this weekend on SHOWTIME and will be available on SHOWTIME ON DEMAND® and the network's authentication service SHOWTIME ANYTIME®. For a full list of replay dates and times, please visit: www.sho.com/marathon. New episodes of Dexter and RAY DONOVAN return to SHOWTIME, on Sunday, September 8 starting at 9 p.m. ET/PT. The first nine episodes of the freshman season of RAY DONOVAN will air on Sunday, September 1 starting at 1 p.m. on SHOWTIME, and the eighth and final season of DEXTER will replay on Monday, September 2 starting at 1 p.m. on SHOWTIME 2™. Season-to-date, season eight of DEXTER is averaging 6.3 million weekly viewers across platforms, its highest-rated season ever. RAY DONOVAN’s freshman season is averaging 5.7 million weekly viewers across platforms, and is on pace to rank as the network’s top performing freshman series ever, outpacing season one of HOMELAND by almost 40 percent. Read the rest of the press release, after the jump. DEXTER stars Michael C. Hall in his Golden Globe® and Screen Actors Guild Award-winning role as Dexter Morgan, a complicated and conflicted blood-spatter expert for the Miami police department. Season eight began six months after LaGuerta’s murder – with Dexter still managing life as a dad, brother, and serial killer. 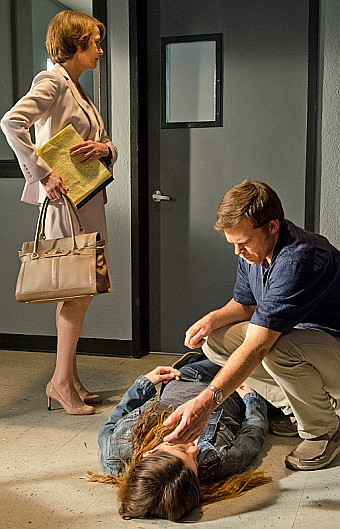 As Dexter and Debra (series star Jennifer Carpenter) begin to mend their fractured relationship, Dexter’s fugitive ex-girlfriend Hannah (special guest star Yvonne Strahovski) makes a surprise return to Miami. As the turmoil of Hannah’s return ensues, Dexter takes on a young psychopath protégé named Zach (guest star Sam Underwood), and starts teaching him the ways of The Code. Meanwhile, Dexter’s reconciliation with Hannah leads him to assist in her escape from the country, while Dr. Vogel (special guest star Charlotte Rampling) gets the surprise of a lifetime when a mysterious figure from her past returns. The series also stars Desmond Harrington, C.S. Lee, Aimee Garcia, David Zayas, Geoff Pierson and James Remar. Produced by SHOWTIME, DEXTER is executive produced by John Goldwyn, Sara Colleton, Scott Buck, Manny Coto, Tim Schlattmann, Wendy West, Jace Richdale and Michael C. Hall. Set in the sprawling mecca of the rich and famous, RAY DONOVAN starring Emmy® and Golden Globe® Award nominee Liev Schreiber as LA’s best professional fixer, the man called in to make the city’s celebrities, superstar athletes, and business moguls’ most complicated and combustible situations go away. Ray’s world is turned upside down when his father, Mickey Donovan, played by Oscar® winner Jon Voight, after twenty years in prison, makes his way to Los Angeles hungry for revenge and for his place at the head of the Donovan family. To Ray’s dismay, his brothers Terry (Eddie Marsan), Bunchy (Dash Mihok) and half-brother Daryll (Pooch Hall) welcome Mickey back in the Donovan family. Convinced his father’s influence will be the demise of the family, Ray activates a plan to send him back to prison, with help from his mentor Ezra Goldman (Oscar winner and guest star Elliott Gould). Later, Ray learns Mickey is working with FBI agent Van Miller (Frank Whaley), whose obsession with the Hollywood murder investigation that put Mickey in prison could lead back to Ray. But, Mickey’s ultimate betrayal comes when he ingratiates himself in Ray’s children’s lives and things go awry under his watch. To get Mickey out of his life once and for all, Ray tracks down the one man who hates Mickey more than he does: Sully (Oscar nominee and guest star James Woods), Boston's most-wanted mobster. Next Sunday's new episode of RAY DONOVAN finds the entire Donovan clan at the Donovan Fite Club's Fite Night, but the only person who is suspiciously missing is Mickey. Using the festivities as an alibi, Ray puts the plan into motion and Sully goes into action. RAY DONOVAN is created and executive produced by Ann Biderman. The series is also executive produced by Mark Gordon and Bryan Zuriff. RAY DONOVAN is a SHOWTIME production.